Mas Pellier is now in the hands of its fifth-generation Pellier, Christophe, whose grandfather founded the winery over 125 years ago. It is located at the southern tip of France in the Languedoc region, overlooking the Mediterranean Sea. For a long time, this region was considered a place to make fairly ordinary wines at cheap prices. The problem, of course, was that nobody made any money doing it. So, many of the owners - one of them Pellier - joined together with like-minded growers and decided to elevate the area in terms of the wines they produced, in order to be granted an A.O.C. status. This took time and commitment from each player, but it worked out. The area in which Christophe Pellier's grandfather first planted vines, Duche d'Uzes, was granted A.O.C. status in 2012. This trend is continuing, as other areas in the region are gradually achieving A.O.C. status and finally getting the respect they deserve. Duche d'Uzes is located just south of the Rhone Valley, and shares many of its geologic attributes. This is why similar grapes - like Syrah and Grenache - are planted in both places. The climate and soil are perfect for it. 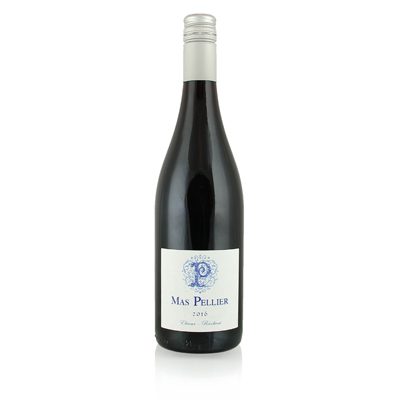 This bottle of Mas Pellier is a Grenache Syrah blend, but with a powerful edge that could only be likened to Chateauneuf-du-Pape. The flavors are big and bold, with earth and berries shining through, along with flecks of spice and cranberry. The finish is long and penetrating, offering berry and earth with a flourish. It's an exceptional example of what Languedoc wine can be. This is an unusual wine. The opposite of fruit forward, it has meaty undertones. It medium bodied and drinkable, but for me really has this bacon-flavor happening.